On 12 May the regional Personal Care meeting started with a half day introduction session from Chemrez, Philippines. 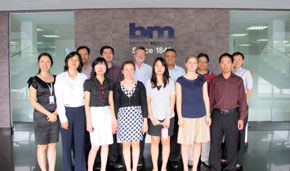 The presentation was held by Mr Tan at Behn Meyer's Ho Chi Minh office. Chemrez produces coconut oils, methyl esters, cocoamides, rheology modifiers as well as refined glycerin and glycerides derived from vegetable oils. In the afternoon the Behn Meyer regional Personal Care Team discussed the developments in each country. On the following day the team went to Vung Tau Village to share information about common suppliers and future opportunities. The colleagues from Vietnam and staff from Indonesia, Malaysia, Singapore, Thailand and Germany then participated at the event to strengthen regional teamwork and to benefit from regional experiences. After the meeting the team enjoyed a delicious dinner at the seaside followed by sightseeing the next day.